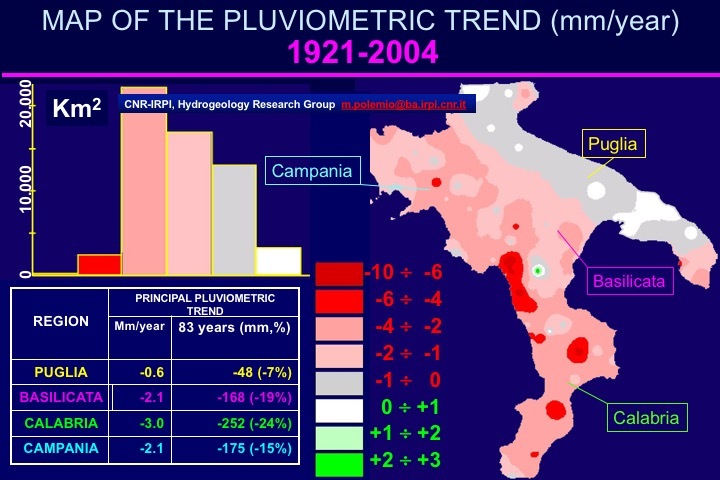 The temperature and rainfall database of Southern Italy has been realized starting from the need to organize and make usable the hydrological data collected by the Hydrogeology Group from decades to be used for scientific purposes in order to pursue many activities and research projects on issues related to climate change, natural hazards and the protection of water resources. The collected data concerns time series relating to rainfall, atmospheric temperature, piezometric levels, spring flow yield and, secondly river flow yield. The geographical area concerned some southern Italy regions with the exception of the island and Molise regions. In particular including Puglia, Campania, Basilicata and Calabria. For each of these regions, almost all the measuring stations located in the area managed by main institutions were considered.